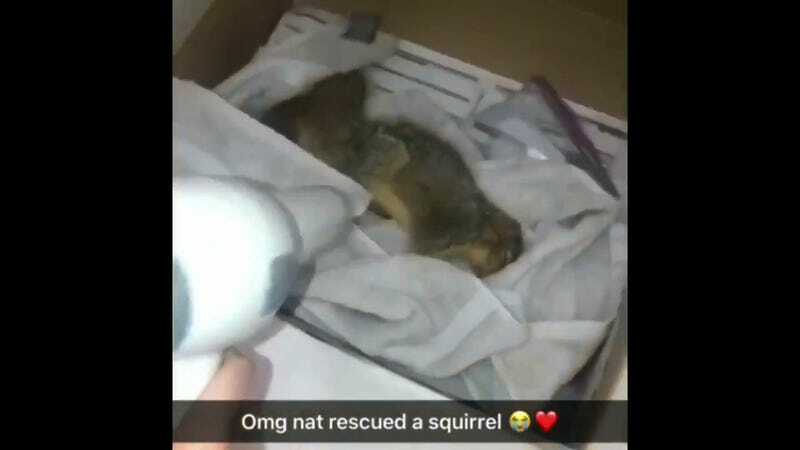 In a heartwarming tale of a college freshman doing something right, Central Michigan women’s soccer player Natalie Belsito saved a drowning critter on campus. She credited the successful rescue to an episode of The Office. She said a man walked by whose arm was long enough to pull the squirrel out by the tail, but he pulled it from the pond with such force the squirrel traveled through the air and hit the cement. “If he would’ve placed it properly, it probably would have run away, but he smacked it on the ground,” [teammate Megan] Riley said. Although the squirrel was out of the water, it wasn’t breathing. While teammate Taylor Zimmerman went to get towels, Belsito performed CPR to the beat of the Bee Gees’ “Stayin’ Alive.” Yes, just like that scene in The Office. Belsito, who said she doesn’t “really know CPR,” tried performing it with the hockey stick, but soon discovered the tactic wouldn’t work. Zimmerman returned to her dorm room to grab towels, allowing Belsito to perform CPR by hand. As the video shows, the squirrel was wrapped in towels and blow-dried while it recovered in the soccer player’s bathroom. The animal was eventually healthy enough to be released back in the wild, free to live its life and roam suspiciously close to college students once again.